Analyze this! You can learn "a lot" from learning how to read a malt lot analysis report. Want to know the temperature of the water exiting your counterflow chiller? Get in line — an in-line thermometer that is. Two big GABF winners — Darron Welch (Pelican Pub & Brewery) and Ben Johnson (Midnight Sun Brewing Co.) — give their tips for brewing big barleywines. Did you ever want to do something just because someone told you it couldn’t be done? 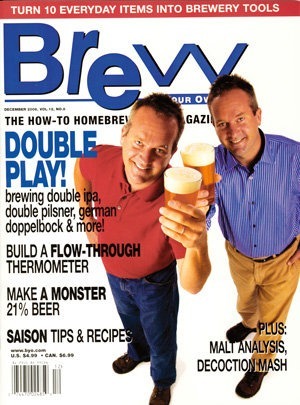 A comment at a homebrew club meeting sets a homebrewer on a quest to brew an all-grain beer over 20% alcohol by volume. Inside of every hardware, home improvement and pet store are homebrew tools waiting to come out.